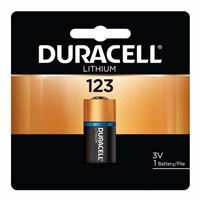 The DL123ABPK is a CR123A 3V Non-rechargeable Battery features a lithium manganese dioxide technology, raised positive and flat negative terminals. Whether for a camera, an alarm system or memory backup, LiMn02 chemistry of HPL battery. Using a spiral-wound construction, they offer ideal power supply for high-drain devices, with high energy density and excellent resistance to cold temperatures.